Qualcomm has unveiled its Snapdragon 8cx for 'extreme' performance, battery life, always on operation, and fast connectivity in PCs. 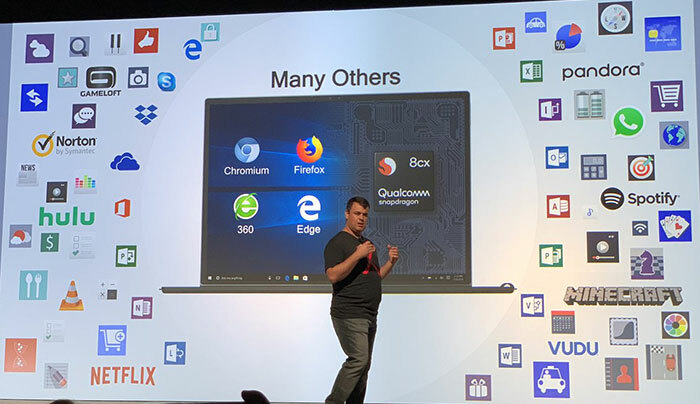 During the last day of its three day conference in Hawaii Qualcomm voiced hopes that, alongside its partners, it can make PCs more like smartphones in an always-on, always-connected world. The firm promises to keep its foot hard on the accelerator after five commercially available devices powered by Qualcomm Snapdragon platforms have launched in the last six months. The key claim from Qualcomm's publicity is that the Snapdragon 8cx is the post powerful Snapdragon ever, designed from the ground-up for PCs and optimised for compute. Even so it is said to strike the correct balance of "supporting premium performance with multi-day battery life". The fastest Kryo cores ever feature in the 8cx. In the Kryo 495 CPU there are 8x cores (four customised Cortex-A76 performance cores, and four tweaked Cortex-A55 power-efficient cores) as well as a larger L2 cache, L3 cache, and system cache - significantly improving multitasking, according to the chipmaker. Compared to a rival Intel 15W solution, Qualcomm claims "equivalent peak performance," but in a fanless, thin and light design. Alternatively, compared to a 7W Intel processor, the Snapdragon 8cx "supports double the sustained performance vs. the competitor's solution but at a fraction of the power". In addition to the pleasing performance on tap, Qualcomm boasts that device designs will provide multi-day battery life on a single charge (and you can fast charge with Qualcomm Quick Charge 4+). 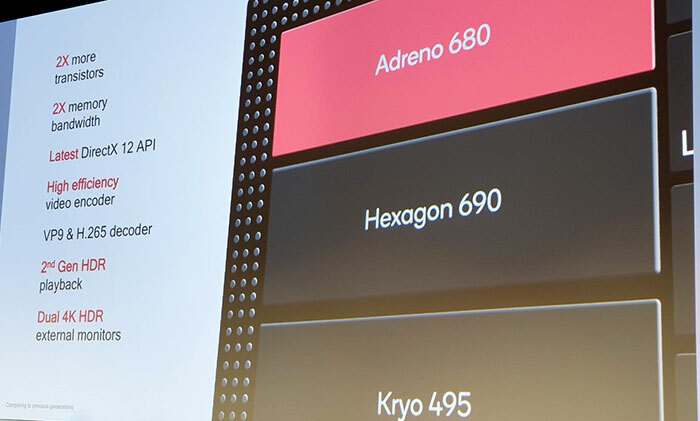 Qualcomm's Adreno 680 is the strongest GPU ever made by the firm. It claims that the Adreno 680 is 2x faster than the previous generation and 60 per cent faster that the SD850. In order to gain this muscle the GPU contains double the number of transistors and delivers double the memory bandwidth - it is also DX12 compatible. The goodies don't stop there, Qualcomm's chip supports most of the connectivity standards you would expect on a modern PC such as 2nd gen USB 3.1, 3rd gen PCI-E, UFS 3.0, NVMe SSDs, and LPDDR4X RAM. Support for dual 4K HDR displays and cutting-edge Hi-Fi Audio is standard, and systems based upon it are ready for quality wireless sound delivery to your headphones or external speakers. To satisfy the always connected part of the proposition the SD8cx integrates the Snapdragon X24 LTE modem with Category 20 LTE and speeds of up to 2.0Gbps. 4X4 MIMO and 7X carrier aggregation are also supported and Qualcomm says that this modem is supported by over 90 per cent of global mobile operators. Coinciding with the new Qualcomm hardware launch we hear that Office 365 and Gameloft gaming titles are among the wide range of titles that work slickly and, for the first time, a native ARM64 browser is available - Firefox. I think this is great. This will push both AMD and Intel even more. ANd maybe invite others ARM cpu makers to join the game. The rumors are constant that Apple is preparing their arm cpus for their laptops and desktops so they can get rid off Intel, AMD and others. They are going for almost full vertical integration. I think for laptops this could be seriously disruptive. Intel are about to get hammered in all areas by the look of it. As for removing user serviceable parts - surely this is going to be confined to slimline laptops which are not exactly user serviceable anyway? I doubt it'll make it into desktops as so many compromises will have been made for power efficiency. I think there's a big market for responsive, small, ideally cheap productivity / browsing machines - the netbook fad a while back demonstrated that, it's just they were a little too meh. Get that package with more modern designs, flagship phone responsiveness, fast storage and always on internet and people will lap it up. A lot of people on here might not find it appealing but I bet normal people who won't mind / won't even see the restrictions will love it. To be fair that begun some time ago, notably with ‘ultrabooks’.